Mountain monograms perch on the hillsides above communities all over the country. They occasionally denote towns or neighborhoods, but mostly they stand as beacons of school spirit and pride for high schools, colleges and universities. Some letters are constructed of concrete, rocks, wood or metal. Others are created by cutting away trees or bushes to leave a monogram. Some are simple monograms that are painted on the side of the mountain. Utah is currently home to around 70 mountain monograms. Its two largest university rivals, the University of Utah and Brigham Young University built some of the first mountain monograms ever. 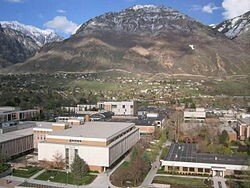 And though Utah may be a conservative state, its mountain monograms were built due to the influence of one of the most liberal universities in the country. The first permanent mountain monogram in the country was constructed in 1905 for UC Berkeley. The ‘Big C’ was a truce of sorts between the ‘07 and ‘08 classes, who each wanted to build something that would mark their time at Berkeley in a permanent way. Instead of the two rival classes competing against each other, they worked together to create the gold mountain monogram ‘C’ that still stands proudly on Charter Hill to this day. Weather allowing, a short 10 minute hike to the ‘C’ provides a stunning view of the San Francisco Bay, especially during sunset. Mere weeks after Berkeley’s ‘C,’ the University of Utah’s freshmen and sophomore classes began designing a ‘U’ to display their school pride. The students had been painting a ‘U’ directly onto the hillside for several years, but they wanted something more permanent. The 100 foot-tall limestone ‘U’ was installed in 1907 on Mount Van Cott, just above and to the north of campus. In 1967, lights were added to the ‘U’ and it was illuminated during home games. In 2006, the ‘U’ underwent a $400,000 renovation. The existing lights were replaced by 240 alternating red and white lights that are controlled from the engineering department with a remote antenna. Drainage was added to minimize erosion. The Block U (which is the official, trademarked name of the monogram) can be accessed from a trailhead at Tomahawk Drive. From the ‘U,’ hikers enjoy views of the entire Salt Lake Valley. Down below, fans can see the ‘U’ blink red and white when the school wins a game, or hold steady with white lights when the school loses. Not to be outdone, the University of Utah’s main rival, Brigham Young University, soon created its own mountain monogram. In 1906, students began planning to construct the letters ‘BYU’ 1 mile up from the base of Y Mountain, just east of campus. The letters were outlined and a huge group of high school and university students formed a bucket line to transport buckets of lime and rocks to fill the letters in. The aggressive size of the letters proved to be their undoing, though; after six hours, only the ‘Y’ was filled in. The exhausted students decided that one letter was enough. BYU’s ‘Y’ is the fourth largest mountain monogram in the country, measuring 380 feet tall. 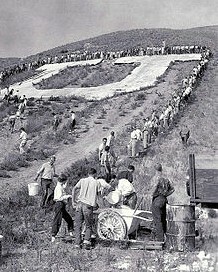 The ‘Y’ required annual painting, which was accomplished much the same as the construction; utilizing thousands of students in a bucket line to get the paint up the mountain. The practice continued until 1973, when it was determined that the students were contributing to the erosion of the mountain face. Since 1975, the white paint has been carried up to the ‘Y’ with the assistance of a helicopter about every 5 years. In 1924, the tradition of lighting the ‘Y’ began with students placing mattress batting soaked in kerosene in buckets along the edges of the letter. Torches were used to light the batting, which would illuminate the ‘Y’ for up to 20 minutes. Concerned about the fire risk, in 1985 BYU began lighting the ‘Y’ using a generator and 14 strands of 25-watt bulbs. The ‘Y’ can be accessed by hikers from the Slide Canyon/Y Mountain Trail. From the vantage point 1.2 miles up the mountain, hikers enjoy views of Utah Valley and Utah Lake. 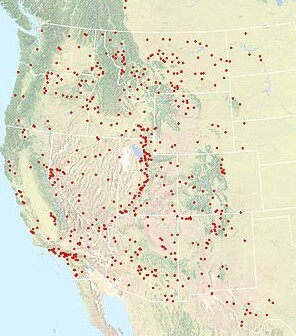 There are over 500 mountain monograms across the United States, but most of them are in the western states. California boasts the largest historic number of monograms—81 (which includes some monograms that no longer exist). Utah has the second largest number at 72 (two no longer exist). Though most mountain monograms are located in the Western U.S., some are found on the east coast, including Columbia University’s ‘C,’ which is located along the Harlem River in New York City. The tallest monogram is the Lassen High School’s ‘L’ in Susanville, California, which stands 580 feet tall. The first mountain monogram in Berkeley was originally protested by residents who were concerned about erosion. But over time, mountain monograms have become sources of community pride and have gained support. During fundraising for the University of Utah’s ‘U’ renovation, over $200,000 in excess donations were collected from local Salt Lake residents and U of U alumni. Following 9/11, many mountain monograms were temporarily repainted in red, white and blue. Every letter of the alphabet is represented by a mountain monogram, except for the letter, ‘X,’ which is still present in the mountain sign ‘DIXIE’ for Dixie High School in St. George, Utah. Mountain monograms will always be a mark of community spirit, especially in the West. What’s your favorite mountain monogram? Tell us about it here!